Pit stop at Fat Heads to recreate the moment Collin made the first move. Bet he didn’t know buying a chick a Guinness at his own birthday celebration would nab him a wife. 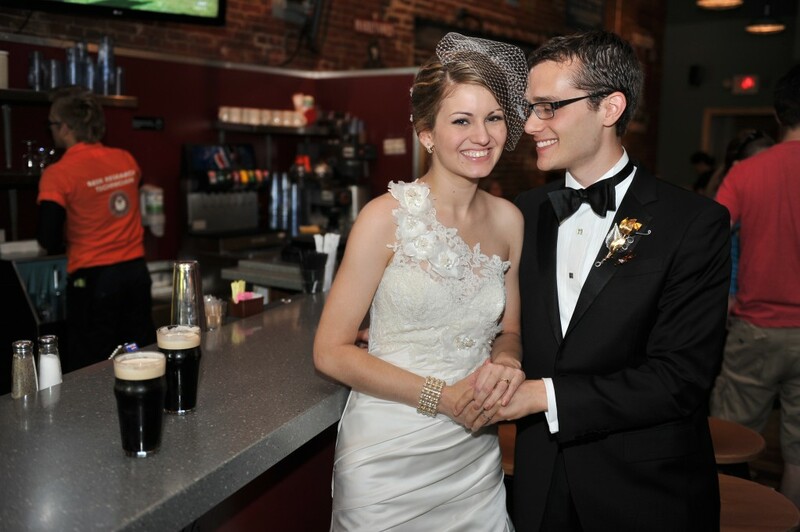 Photo by Louis Stein, who had truth in his voice when he asked some guys to clear a space on the bar for a bride and groom. Abso-freaking-lutely adorable. Also, a relationship that starts with Guinness? AWESOME. You two are SERIOUSLY gorgeous. And re-creating the first move: priceless. You both look absolutely stunning in this picture!! I LOVE that you stopped off at the place you got together. If only we could do that too… but that would involve a 24 hour flight to London. Sigh! dear LORD but you’re both so STUNNING. Holy awesome, Batman! this one’s a keeper. You are stunning! awww so great! You are stunning!